In a world where violence and aggression make it easy to despair of one’s fellow man, it’s nice when science reminds us that oftentimes, like other primates, we just want to feel the love. On Wednesday, Oct. 24, the CNS brought preeminent primatologist Frans de Waal from Emory University to give the first annual GVR Khodadad Endowed Lecture on “Prosocial Primates: Selfish and Unselfish Motives.” Dr. de Waal has long studied animal behavior and has made particular waves with his findings on primate empathy, challenging two influential notions: one, that non-human animals do not feel emotions we consider to be complex, and two, that humans and our closest relatives are fundamentally brutes. It was a fun twist to launch the Khodadad lectures with a talk on primates helping each other, given that lecture sponsors Ghahreman Khodadad and sons created their fund to examine the biological bases of aggression and selfishness. In front of a large, professionally diverse crowd (which included the Khodadads), Dr. de Waal shared insights on prosocial primate interactions. One of his most interesting points was that a behavior can seem unselfish from an animal’s perspective even if it does have long-term gains for the individual, blurring the line between what is “selfish” or “unselfish.” He also noted that empathy has two components: the cognitive capacity to understand the feelings of another individual, and the emotional capacity to share those feelings (a psychopath, for example, might have the cognitive capacity but lack the emotional one). And though Dr. de Waal was careful to note that empathy can work differently in humans than in our close evolutionary relatives, much of his talk focused on what we’ve got in common – which is what our self-centered species likes to hear, anyway. What attracted you to the study of empathy? 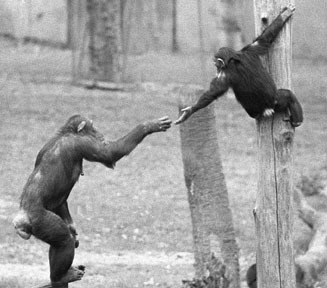 How much do you think your work has changed how people view continuity between other primates and humans? Oh, I think quite a bit. In the area of conflict resolution, certainly, and power politics. But also with the whole empathy issue, about 10 years ago no one talked about empathy in animals, and now there are lots of studies, not just in the primates – there are even rodent studies now. That whole topic has been broken open. Initially there was some resistance, people saying, well, empathy is a human thing, it’s not something that animals do, but that view is disappearing quite rapidly, I think. Do you think this suggests that aggression plays a less important role [in behavior] than we previously thought? No, unfortunately aggression is always there, it’s not going to disappear. But there are other mechanisms that compensate for it and help counter it. This is an interesting time in American politics with the elections coming up, and in the past you’ve lamented the ways politicians have misconstrued science for their own purposes. How do you think your research can inform or correct some of this misuse? I think the way science is sometimes misused is that some people believe that nature is all “red tooth,” and tooth and claw, and we need to model society on the way nature is. There are sort of two questionable assumptions there: one is that nature is “red tooth” and claw, and I think there’s much more to nature than just that – there are many animals who are cooperative. And the second [assumption] is, where does that idea come from, that society needs to mimic nature? But that’s sort of the Social Darwinist view, that nature is harsh and society needs to be harsh, as if that’s based in biology somehow. I think that’s a very questionable [view] of biology. The evolution of altruism has been another controversial topic, and it’s related to empathy – what kind of story has emerged in terms of possible evolutionary bases of empathy? For empathy, I think we’re pretty clear. The scientists who work on empathy in humans think it started with maternal care, and I think the same thing. That’s why all the mammals have some degree of empathy, because all the mammals have maternal care, by definition. So it started with females needing to pay attention to the offspring, their needs, their hunger, their fears, and so on…to help them survive. And that explains two things: why empathy is more developed in females than males, which is universally shown for the human species,* and we’re finding that increasingly with animals, at least with mammals. And also the role of oxytocin in empathy, which is increasingly studied, hence the connection with maternal care. And I’m not sure you can divorce mammalian altruism from empathy, because certainly the most dominant hypothesis to explain human altruism is that it runs via empathy. Of course we are sometimes altruistic without that, [you can have] a businessman who helps you in the expectation that maybe in the future he’ll get benefits – that sort of stuff happens also. There may be no empathy whatsoever involved, so humans are not restricted by that. But most human altruism – as in, say, we send money to tsunami victims in Japan – that’s all triggered by empathy. What are some pressing questions you have left for your research? We’re still looking at how cooperation works, how well animals understand their own cooperation. For empathy there’s a ton of studies that can be done – some of it will require neuroscience, though with chimpanzees it’s virtually impossible. With humans you can put them in a brain scanner and ask them questions, or show them a video of something they react to, but if you put a chimpanzee in a scanner you have to knock them down. So that excludes all these experiments. One day there will be neuroscience in this work – I think we will see the day you can put just a little helmet on them or something, or train them to stick their head in a helmet, or whatever it is, but we’re not at that point yet. Are there any particular neuroscientists, or sub-fields within neuroscience, that you would really like to work with? At Emory there’s tons of neuroscientists, and I’ve worked a little bit with people on autism, because autism is often seen as a deficit in empathy. I’ve also worked with people who want to do oxytocin studies in primates, or who want to do those sorts of things with children. There’s an enormous amount of contact [between fields]. What I like about neuroscience is that they have broken open that taboo on emotions. In animal behavior you were not allowed to talk about emotions…but the neuroscientists, they started testing fear in rats, and love in humans, and all sorts of emotions, and they noticed that the same brain areas are involved in fear in rats and fear in humans. All of a sudden that whole taboo started to crumble, because clearly if the neuroscientists take the emotions of animals seriously…then the behavioral scientists like myself are freer to talk about them and do something with them.